Chocolate cake seems like a good February dessert. It’s the month of love with Valentine’s Day around the corner. Plus, it’s winter and a great time for serious comfort foods. Foodie sponsored this post. All opinions are my own. It’s been too long since I have had a truly scrumptious chocolate cake. Sure, I have had my fair share of chocolate desserts, but a great cake? Not in quite some time. Thanks to browsing Foodie.com, that’s about to change. Foodie has so many recipes from which to choose. 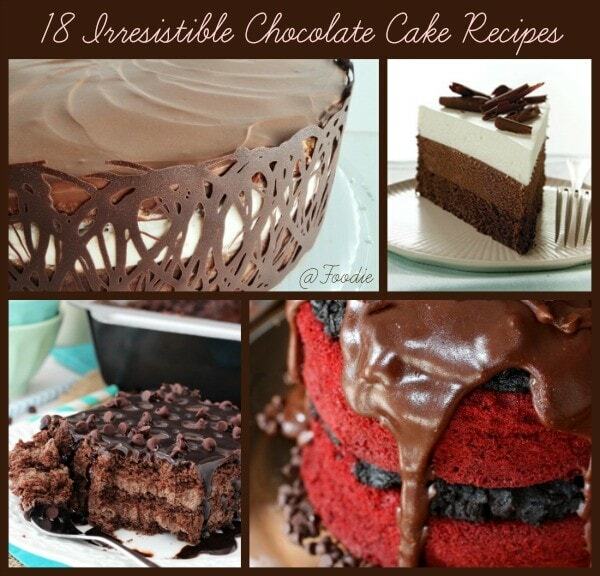 I grabbed 18 of them, but if you do a search for chocolate cake there are so many more recipes. The awesome thing about Foodie is that it’s like Pinterest, but with food only. So if recipes are what you are looking for, that is what you will get. As always, I am beyond impressed at how creative people have gotten with cake recipes. The flavor combinations, frosting choices, and appearance of most of these cakes have me drooling. I cannot wait to try some out. I think this is just what we need for our Valentine’s Day dessert. Which chocolate cake looks the best to you? Or, do you have a favorite cake recipe of your own? wowwwwwww! and I think I drooled a little, giggle. I invite you to share at my blog hop( you can link up through Sat) Hugs! I would happily eat any of these (if someone would make them). These look amazing! The chocolate ice box cake look like one I would try first, oh the choices when it comes to chocolate. There is a chocolate cake theme of this day for me. I’m thinking I need to seriously make one of these…and soon! OMG seriously drooling over here. I really need to make one of those soon! So… much… chocolate. This is seriously one of the most awesome collections I’ve ever seen. The death by chocolate icebox cake looks fabulous! Oh my goodness, chocolate cake is my weakness! That chocolate red velvet cake is calling my name! I can’t think of anything more delicious! These cakes look so delicious. The recipes are awesome. oh my goodness I love chocolate!! All of these cakes look mouthwatering and so amazing!! Great collection of recipes! These all look so good! Thank you for sharing!!! OMG, they all look so good. Then again, chocolate cake is my favorite dessert! yummy! I love anything chocolate and I will have to try some of these out! Maybe I can get my hubby to make me one for my upcoming birthday. Oh my talk about bite marks on my computer! lol. Love these ideas and recipes great for Valentine’s too. Thank you for sharing. The Death by Chocolate Icebox Cake is a must try! What a great list of so many delicious recipes. I of course like most of the world love chocolate. That Death By Chocolate Cake recipe looks delicious. I’m going to have make that recipe soon. I love chocolate cake! I love making this cake and having it for my birthday! I want to make a Red Velvet Cake soon!